Christopher Howse takes issue with the way the Victorians are presented in Jeremy Paxman's new series, which starts today (Sunday, 15 February) on BBC1. "To Jeremy Paxman, Victorian houses look grim," he says. "Grimness is a leitmotif . . . workhouses, gruel, industrial accidents, slums, the usual suspects of 'Dickensian conditions.' But that is all wrong. The Victorians were a fiery bundle of energy – noisy, voracious, partial to bright colours and bad jokes, fit, energetic, sentimental but hardy, unconventional but addicted to reform and liberty." A. N. Wilson has another take on the series: "The programme is a meditation on the Victorian success story: how they invented the modern city and learnt to live in it. Behind each sequence is a pair of self-contradictory thoughts. As someone who has himself written about the Victorians, I completely sympathise with Paxman's dilemma. On the one hand, we recognise the sheer monstrous cruelty of it. On the other, how can you not admire the brilliance which constructed the London sewers, or the railway system, or the ever more ingenious machinery that spun cotton or smelted steel?" Read more about the series and get broadcast times here; Paxman is interviewed by the BBC here. The book based on the series is reviewed -- er, savaged -- by The Times here and given the "Digested Read" treatment by The Guardian here. Read my previous post on the series here. Shown here, two of the paintings featured in the series. 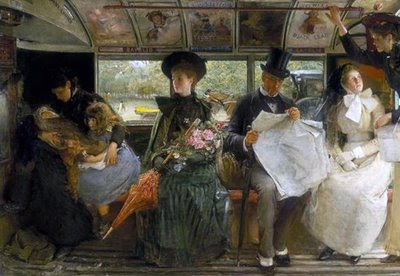 Top: The Bayswater Omnibus (1895) by George William Joy (1844-1925), in the collection of the Museum of London (click for much larger image). 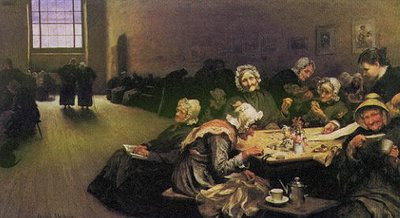 Bottom: Eventide: A Scene in the Westminster Union (1878) by Hubert von Herkomer (1849-1914), in the collection of the Walker Art Gallery, Liverpool. This blog is really good and the topics are picked perfectly! excellent blog, I always look forward to your posts.